The solvency ratio stood at 203.1 percent, maintaining great strength and stability, thanks to the Group’s diversification and strict investment policy. 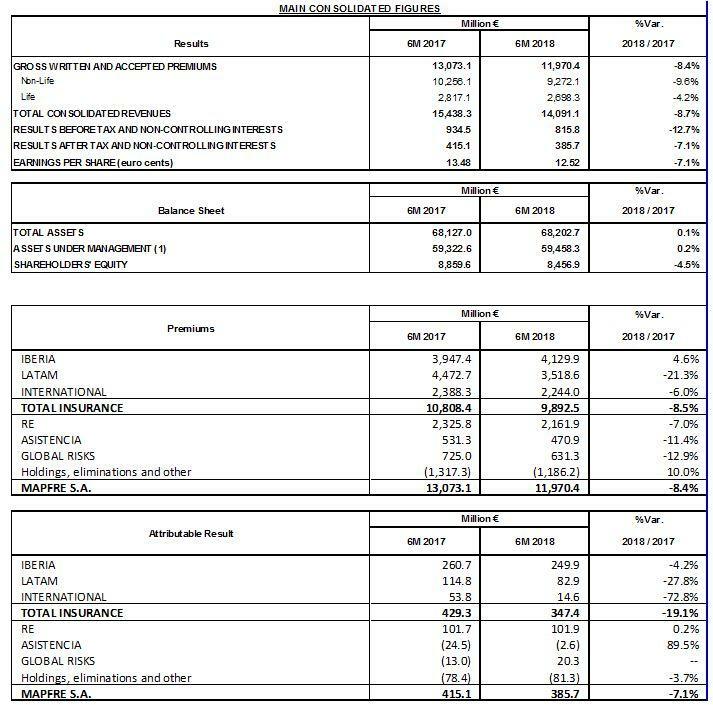 MAPFRE’s revenues in the first six months of this fiscal year amounted to 14.1 billion euros (-8.7 percent), while premiums reached 12 billion (-8.4 percent) and net earnings were 386 million euros, 7.1 percent lower than the same period of the previous fiscal year. This performance can be explained by the strong depreciation of the main currencies (U.S. dollar: -9 percent, Brazilian real: -16.6 percent and Turkish lira: -19.8 percent) and the decrease in financial returns (due to lower interest rates in Brazil and other countries in the Americas, and the low-rate environment in Europe). Recurring earnings have shown solidity in 2018, up by 4.9 percent after excluding atypical elements from the previous period (bank channel provisions and the sale of real estate in Madrid). The solvency ratio stood at 203.1 percent in March 2018, maintaining great strength and stability, thanks to the Group’s high level of diversification and strict investment policies. Equity stood at 10.1 billion euros, while shareholders’ equity amounted to 8.5 billion euros at the end of the first half of the year, with total assets amounting to 69.2 billion euros. In Spain, premium growth was even higher, rising 4.9 percent to 4.1 billion euros, thanks mainly to the improved business in most lines. The Automobile business turned in a strong performance, 2.7% better (three tenths more than the sector) at 1.1 billion, boasting an increase of almost 170,000 insured vehicles (topping 5.67 million) and an improvement in the combined ratio of 3.8 points to 89.7 percent. The loss experience for this business improved thanks to the cancellation of unprofitable policies, mainly in fleets, and VERTI’s healthy performance. Health and Accident also grew by 6.3 percent to 566 million euros. MAPFRE VIDA’s business, meanwhile, stood at 1.2 billion euros, slipping 1.1 percent on the back of reduced Life Savings issuing. Discounting the business of Unión Duero Vida in 2017, which was sold that year, premiums grew by 1.9 percent. Mutual funds closed the first six months at 3.5 billion euros, down 2.9 percent, while pension funds rose 3.8 percent to 5.1 billion euros. → Premiums in the Eurasia Regional Area at the end of the first half of this year stood at just under 1 billion euros (-4.3 percent), weighed down by the depreciation of the Turkish lira (-19.8 percent) and other Asian currencies, among other reasons. In Turkey, premiums fell 21.7 percent to 281 million euros, due to the implementation of strict underwriting within the framework of the company’s profitable growth strategy. Additionally, the effect of the official tariff limitation on automobile insurance in this country continues to be felt. Italy grew by almost 1 percent to 254 million euros, while in Malta, an increase of 6.8 percent brought in premiums of 211 million euros, with Germany reporting 203 million euros, up 1.2 percent. The Reinsurance Unit’s total premiums were 2.2 billion euros (-7 percent), with the drop explained, once again, by the currency effect, in that a significant part of MAPFRE RE’s business comes from countries outside the European continent. This business unit has succeeded in maintaining excellent profitability levels in the current context, delivering stable net earnings of 102 million euros.